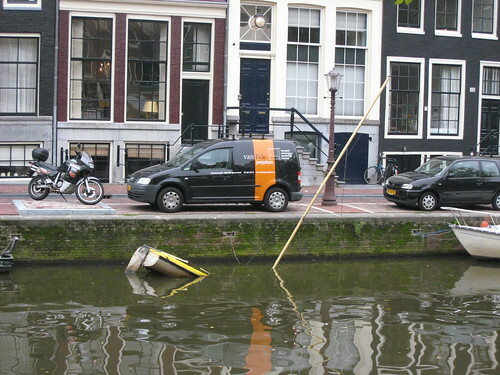 Now, with all the low bridges on the Oudezijds Voorburgwal I am wondering: how did this sailing boat get here in the first place? 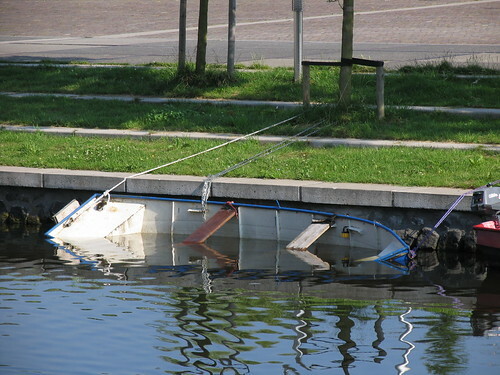 Cry for help: my bootje is sinking! as you can see I’m in need of urgent help. 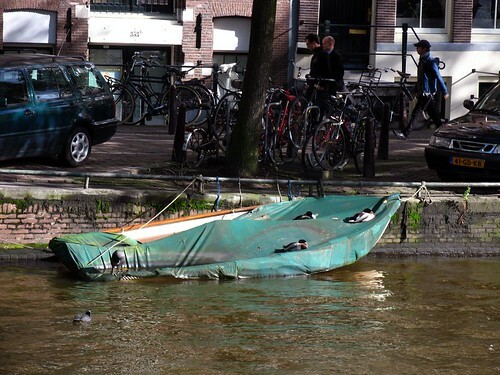 I’m an Italian girl that bought a small polyester boat that is now sinking near Stadionkade in Amsterdam. I’ve been trying to contact the guys at Hoosjebootje but didn’t get any help so far… do you have by chance their phone no? Thanks very much for the attention! A few ducks are happily sunbathing on this almost swamped boat. Although it has a tarpaulin trying to keep out the rainwater, I wouldn’t be surprised if this one went under pretty soon. 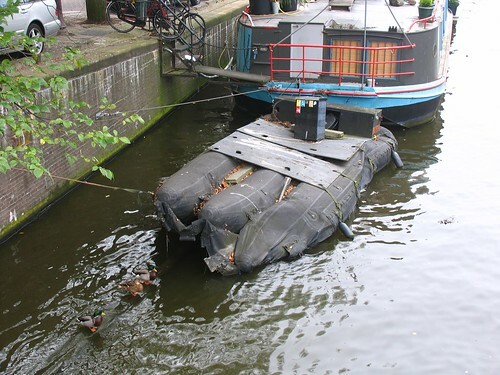 You see these kinds of banana-boats a lot in the canals of Amsterdam, but what are they exactly? Former militairy floating devices? I have no idea. Anyway, the big drawback to inflatable bootjes seems to me that inevitably they go pssssssss as has happened to this one. Once student leader Maarten van Poelgeest was my hero, or at least the guy who led us to demonstrate against the evil Minister of Education Deetman (what exactly the issue was, I forgot, I must admit). Now Van Poelgeest is in power himself. He’s is an alderman in Amsterdam (wethouder Waterbeheer) and he’s trying to pull a stunt that makes one very, very cynical about former student leaders. He wrote a letter this week, addressed to all bootje-owners of Amsterdam, saying that the city is going to raise taxes for bootje-owners by 250 to 400 percent. This will make it very difficult, if not impossible, for lower income people, arguably the constituency Van Poelgeests own Green Party, to have a bootje in Amsterdam. If Van Poelgeest gets his way, it’s the yuppies completely taking over our canals (and you will have no more great looking gezonken bootjes either, I can assure you). 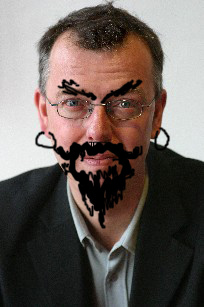 The only party at this moment that is againt the measure is, I am forced to admit, the VVD. People, please protest this ridiculous measure. Maarten van Poelgeest is here. update: more people are upset, tientje.com for instance. 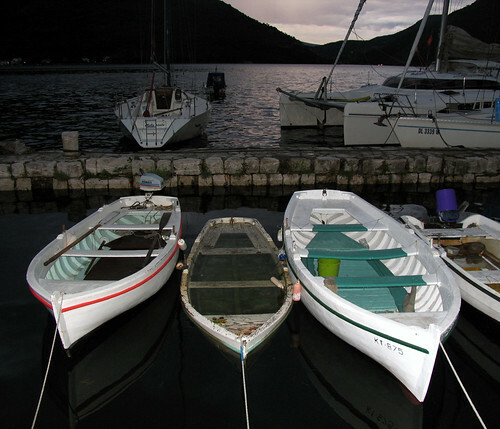 They’ve got Gezonken Bootjes in Montenegro as well. It’s hard to see but the one in the middle is definitely going down. This ‘gezonken bootje’ demonstrates why the city dislikes them so much. The chain and rope that keep this boat from sinking are pulling on the young tree, which is probably going to get damaged.